Dante Cesa alerted Macrumors to the Apple Maps backpack man this afternoon. 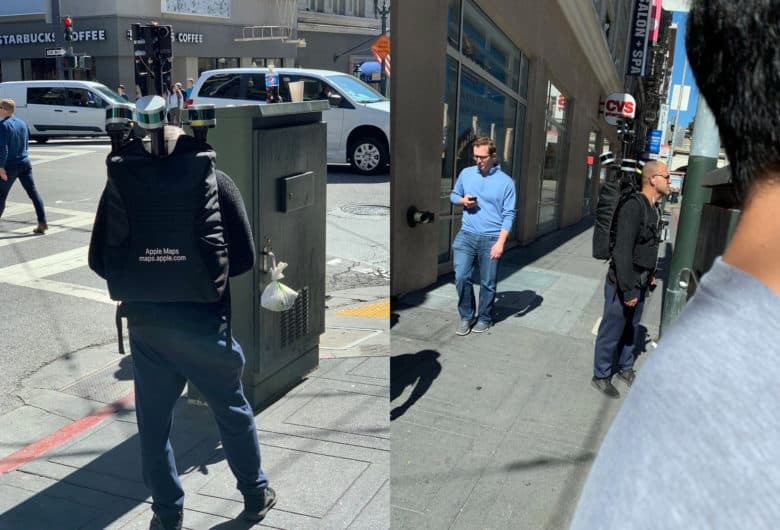 This is the first time Apple’s mapping sensors have been seen on foot. Apple recently came out with the second version of its mapping vehicles. People in Los Angeles saw the new Subaru SUVs roaming in the area recently and they’re sporting a new array of sensors that look like they’re stored in a giant honeycomb on top of the car. Collecting data on foot should help Apple get better info for pedestrians and transit info. Apple Maps got a bunch of new features with iOS 12 changes including more data for foliage, building shapes, parking lots and walkways. The entire rebuild of Apple Maps will likely include years of improvements as Apple keeps gathering more data. Before iOS 12, Apple Maps used some data that was sourced through third-parties. Now Apple is taking all data collection duties upon itself, which will hopefully finally give Google Maps some competition.